François Baucher (1796—1863) was the center of one of the most famous controversies in the development of modern equitation. Baucher introduced the one tempi flying changes at the canter, but in nineteenth century France his circus performances and methods of haute école training were attacked. Attempts to introduce his theories to the French Cavalry were blocked, although he is now recognized as an out­standing horseman and exponent of classical dressage. 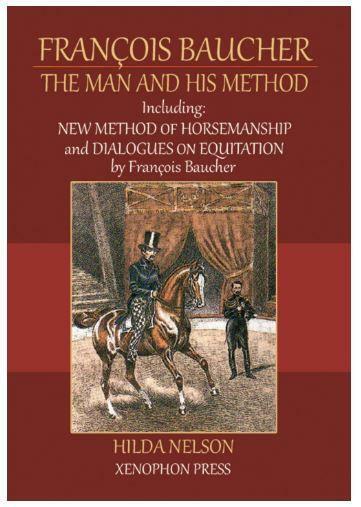 This important work combines a translation of two of Baucher’s publications:New Method of Horsemanship and Dialogues on Equitation, with a scholarly study of the arguments which surrounded them. Professor Hilda Nelson produces a fascinating insight into an important theory of horsemanship. Hilda Nelson is Emeritus Professor of French Civilization and Literature at San Diego State University in Southern California. She is the author of several books and articles on the subject, and translated Antoine de Pluvinel’s classic of horsemanship The Maneige Royal, Xenophon Press 2010. In 1983-1984 she spent part of a sabbatical at St. Antony’s College, Oxford, and visited England and France many times to pursue her investigations into the relationship between classical horsemanship and humanism, both through written works and through observation at the École Nationale at Saumur. She also takes dressage lessons both in England and the United States. She lives with her husband, horses and dogs in California.